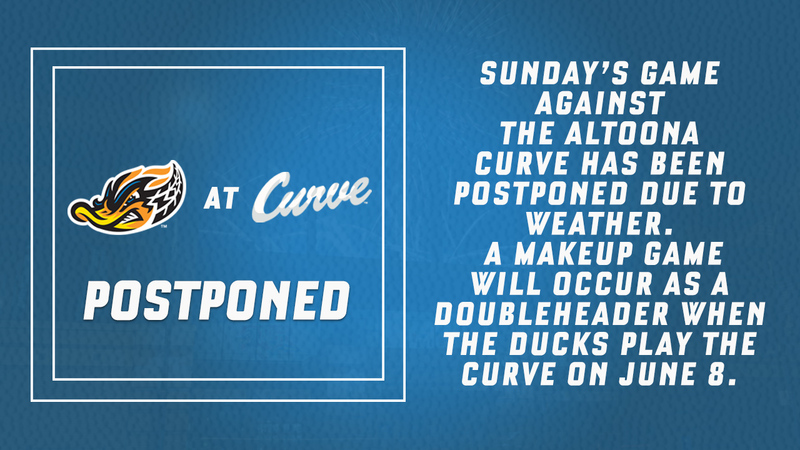 Rain postponed Sunday's game between the Akron RubberDucks and Altoona Curve at Peoples Natural Gas Field in Altoona. The game will be made up in a doubleheader of two seven-inning games on Saturday, June 8, at a time to be announced, during Akron's next trip to Altoona. The rainout is the second of the series. The teams made up Friday's rainout with a Saturday doubleheader, which the RubberDucks swept to earn their first series win of the season. The RubberDucks open a three-game series in Trenton on Monday at 7:00 p.m. EDT. The game will be broadcast on Fox Sports 1350 AM, the WARF iHeart channel, and the TuneIn Radio App.